Living in Arizona is great when the weather conditions are nice. We have beautifully comfortable winters, and monsoon season is fun for those of us who love the rain. But what about the pests that bother us on a daily basis and invade our homes. They don’t belong there and sometimes there’s only so much you can do to get rid of them. One of the most annoying, frightening and most difficult pests to deal with is the ever present bark scorpion that nests in Arizona and sometimes in our homes. Here are a few tips to getting rid of the scorpions in your house. The first thing you need to do is to locate the scorpions and figure out if they are nesting in your home and just exactly where they are hiding. To do this, you need to get a UV light. This is helpful because when a UV light is projected onto scorpions, they glow. This is useful for finding them, especially in the dark, and it is a relatively inexpensive tool to use. All you have to do is remember to buy the batteries that will enable you to operate the flashlight. You can buy the flashlight from any store, or for your own convenience, you can also find them on Amazon. Once you have found the origin of your scorpion problem, all you need is a way to take care of it. First on your list of tools to exterminate these little buggers is a backpack sprayer. With a backpack sprayer, this will make it much easier for you to spray the entire perimeter of your house in a small amount of time. You won’t have to lug around a can of chemicals either. You can easily find one of these at your local hardware store, or again, visit Amazon to find the cheapest products available to you for exterminating and sealing out scorpions in Arizona. The next items that should be on your list for purchasing should be the chemicals you are to use. 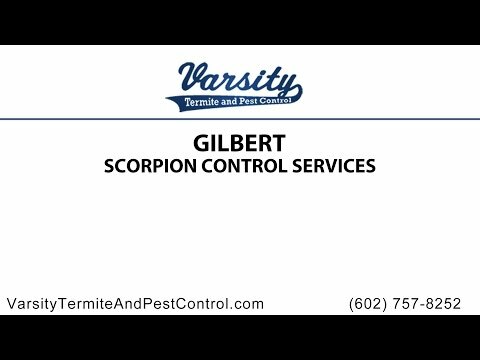 If you know anything about Gilbert scorpion control and home sealing, you know that scorpions don’t go easily. There are very few chemicals that will work on them. The first chemical you should check out is the Demand CS Scorpion Insecticide. This runs around $30 a bottle. It’s a great spray for your home because when it dries, it is invisible to your eyes, and it works on a variety of bugs for around a year. So in addition to getting rid of scorpions, you can also kill two birds with one stone and take care of the other pesky insects that may plague you. You should apply a large band around doorways, sings, garage doors, under appliances and around the foundation of your home. Use this spray every other month around the same areas to ensure full coverage of your home from all scorpions and insects. Your next effective chemical should be Cyper Wettable Powder Scorpion insecticide. You can get a pound of this powder for around $64 at your local hardware store. Put four scoops of the powder in two gallons of water and make sure to mix it thoroughly. This chemical should be applied outside, as it leaves a white residue indicating how long it lasts and where you have applied it. Spray it in thick bands around the foundation of your home, doors, windows, and garage doors. You want to make sure that no scorpions can get inside. You should do this on alternating months from the first chemical to make sure your house is safe from the invading scorpions. If you follow this strict regimen of chemicals and application, you should be applying one or the other of the insecticides at least once a month. As a relatively low cost way to maintain the scorpion population in and around your home, this is the best solution for a do it yourself option. For more help sealing out scorpions and getting the best scorpion protection in Arizona, come to Varsity Termite and Pest Control, where we can help you get rid of any pests that have been invading your home relentlessly. Our experts are friendly and experienced in pest control and you won’t find a better pest control company in Gilbert. For more information about Varsity Termite and Pest Control, contact us today.